Vishal Sanghavi, Project Manager for Automotive and Transportation at research and advisory firm Aranca, said megatrends such as shared mobility, electrification, connectivity and autonomous vehicles, will lead to a big shift in the redistribution of profits across the value chain, with the emergence of new technologies opening up fresh opportunities. Mr. Sanghavi said increasing demand for shared mobility will contribute to higher vehicle utilisation which will positively drive aftermarket revenues from spare parts and repairs, while connected cars in particular will allow repair and maintenance providers unique insights into customer needs. Mr. Sanghavi was speaking today at the 12th Automechanika Dubai Network, attended by more than 100 aftermarket industry professionals. He advised manufacturers to focus on developing more connected car solutions, adding that connectivity is expected to be the fastest growing mobility trend in the region: “Advanced telematics solutions, vehicle-to-vehicle connectivity technologies and infotainment solutions are some of the most sought after innovations in the Middle East,” he said. 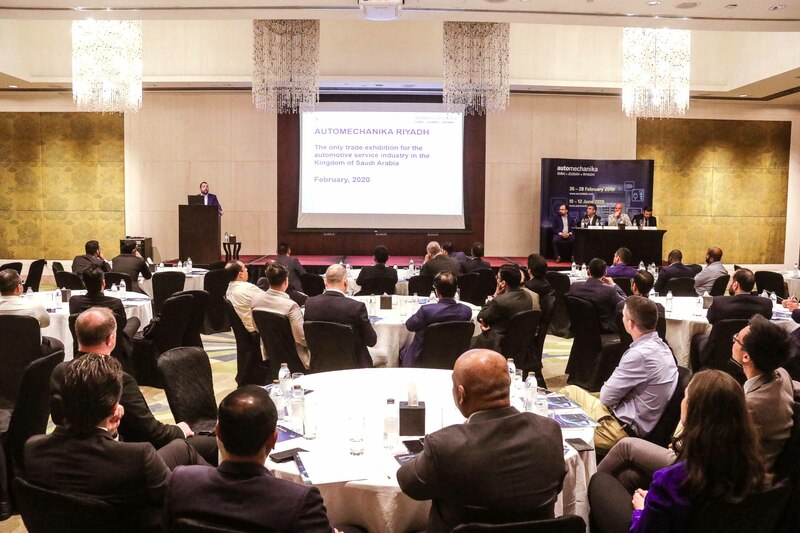 Mr. Sanghavi spoke about the five year impact of mobility trends in the Middle East at the 12th Automechanika Network, a bi-annual gathering focusing on key issues and trends affecting the regional automotive aftermarket. The event is hosted by Messe Frankfurt Middle East, the organiser of the Automechanika Dubai, Riyadh, and Jeddah trade fairs. Also speaking was Christophe Vloebergh, CASE Implementation Manager for Mercedes-Benz Cars Middle East; and Jorge Bialade, General Manager of YallaMotor.com, the Middle East’s largest automotive portal for the sale of new and used cars, car prices, car reviews and auto businesses. Mr. Vloebergh meanwhile, addressed the audience on Daimler AG’s Vision on the Future of Mobility and the manufacturer’s CASE (Connected, Autonomous, Shared and Electric) vehicle portfolio. Mr. Vloebergh said perhaps the biggest change in the industry will be in vehicle ownership: “There’re so many changes we can expect to see in the auto industry, but if I have to choose one, I would say the expected switch from ‘solely exclusive car-ownership’ – as we all know it today – towards a more ‘shared mobility use’ in an autonomous way of course, will be the biggest change,” he said. Automechanika Dubai is the Middle East and Africa’s largest international trade fair for the automotive aftermarket, and is expected to feature more than 1,800 exhibitors from 60-plus countries when it opens for the 17th time from 10-12 June 2019 at the Dubai International Exhibition and Convention Centre. The annual three-day event covers the six product sections of Parts & Components; Electronics & Systems; Accessories & Customizing; Repair & Maintenance; Car Wash, Care & Reconditioning; and Tyres & Batteries. The 2019 edition will also feature four new sub-sections of Agricultural Parts & Equipment; Body & Paint; Motorcycle Parts & Components; and Oils & Lubricants. A key returning highlight is the Innovation Zone, where the very trends discussed today will again be fleshed out. The dedicated area at the centre of the show floor will also feature presentations and product showcases that are steering the course for the regional and global automotive aftermarket. Other features include the Truck Competence initiative, where more than 1,500 exhibitors will showcase their products dedicated to the entire value chain in the truck sector, from truck parts and accessories, to workshop equipment, body repairs and care. The Automechanika Academy also returns, presenting a series of seminars, presentations, and workshops about key issues and regulations affecting the automotive aftermarket, along with IMI CPD workshop certifications.